If you are a WMF Scholarship recipient or you are Wikimedia Foundation Board, staff, FDC, AffCom or Advisory Committee, please DO NOT book your travel or accommodation without being first contacted by the WMF. You will need a "promotional code" so that you can provide information to the WMF travel staff about your hotel and travel needs. For WMF staff, Committee members and Board, please see WMF Sponsored Travel for more information. For WMF Scholarship recipients, please see Scholarship Travel for more information. The Wikimedia Foundation will not arrange visas so please ensure you apply yourself if you require one. The Wikimedia Foundation can support your application with a letter of invitation. For information on acquiring this and information about visas, please see Visas. See Hotel Transport for details on how to get to the Thistle City Barbican Hotel from London's five airports. London is a very big city and sometimes it can take hours to get from one place to another; however, there are many interesting sights within walking distance of the Barbican Centre (such as the Museum of London), and there are many public transport options. The simplest and cheapest way to use London's public transport is with an Oyster Card, a contactless card which is accepted on the Tube, buses, and local trains. Fares are always much cheaper paid with an Oyster card than with cash, and once you have one there is less need to queue for tickets. You can buy them with a refundable £5 deposit at almost any point of arrival. The simplest thing to do is to "pay as you go", topping up your Oyster card with cash or credit/debit card when you need to, which you can do at Underground stations and at most corner shops. You can also load an Oyster card with a weekly season ticket which gives you unlimited Tube and bus travel, which may be a better deal if you are staying a week. Another almost indispensable resource is the Transport for London Journeyplanner, which will give you directions between any two points in Greater London by public transport. The independent website and app CityMapper serves the same function, with the added options of walking, cycling, or taking a taxi. Tube and rail fares are priced based on six concentric "zones", depending on how far out from the centre of London a station is. The venue, together with most hotels and most of the major tourist attractions, is in Zone 1. This zone is the cheapest to travel within. If you are staying further away, you may need to check the Zone of your accommodation. Inner London is roughly zones 2 and 3, and outer London zones 4 to 6. Note that Heathrow Airport is in Zone 6. If you are staying in inner London it may be cheaper to buy a travelcard covering only the zones you need for your accommodation, and single tickets to and from the airport. Travelcards are not valid on Heathrow Express trains, or on Heathrow Connect trains to Hays & Harlington. London City Airport is in Zone 3, but the other airports are not within the London Transport system at all and aren't covered by Oyster cards. Transport for London's Single Fare Finder gives the cost of all point-to-point tube, DLR, Overground and Rail journeys in London. London Underground: The famous London Underground (known locally as the Tube) is the oldest metro system in the world. It covers all of Central London and much of Greater London. The nearest Tube station to the venue is Barbican. Moorgate tube is also very close, while Old Street and St Paul's are within easy walking distance. You can change trains free of charge at Tube stations, so transport between different lines is possible (and indeed often necessary). Directions are generally well signposted while in the stations, and Tube maps are plentiful. When going up and down the escalators at a Tube station, don't forget to stand on the right-hand side of the escalator and leave the left-hand side of the escalator free for people to walk up and down. Londoners in a hurry have little patience for tourists who neglect this custom. London's Tube trains can vary in size, meaning at certain times of day (such as the rush hours in the morning and afternoon) it may be very crowded and difficult to board the train. Always remember that trains are frequent and missing one is sometimes the best option. It can get very hot and stuffy in the stations and on some older trains. It is advised to carry bottles of water while travelling to prevent dehydration. If you do feel ill while on the Tube, first get off the train at the next available stop, then seek the help of a member of staff at the station. The Circle, District, Metropolitan, Hammersmith and City, and Victoria lines were recently upgraded with new, air-conditioned trains which are recommended if possible and for long journeys, though none of these lines go to Old Street or Barbican (though they do go to Moorgate, which is very close to the venue). It is advisable to travel light on the Tube to save space for other passengers, but travelling with bags is not uncommon; use common sense and stay out of the way of other passengers. 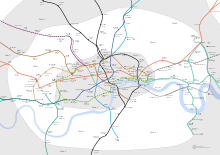 London is the hub for a very substantial railway system that covers many of the places in outer London that are not covered by the Tube, and connects London to the rest of the UK and continental Europe. If you're considering visiting other parts of the United Kingdom, you can do so from many of London's railway stations, though the largest and best-connected are King's Cross, Euston and St. Pancras. St. Pancras is also the usual international railway station with services to mainland Europe. London Buses: There are hundreds of bus routes in London. It is often quicker to take a bus than to make a journey by changing several Tubes. The bus is also cheaper, and gives you a much better view of London! Beware: London buses do not take cash! You will need an Oyster Card, which also covers cheaper underground travel. Buses can be a little intimidating for visitors because it can be more difficult to tell which service to take and when to get off. Fortunately, most bus stops have a map which shows where you can get each bus route in the area and where they go. The bus also announces the name of the next stop to you. After about 1am, when the Tube stops, night buses are the only public transport available. The night bus routes are slightly different from regular daytime buses. Night buses also have a bit of a reputation for rowdiness so are only recommended for confident visitors. Taxis: London has both taxi (the recognisable "Black Cabs") and minicab services. Taxis can be flagged down in the street and will take you anywhere in Central London—drivers are required to have a phenomenal knowledge of all the streets in Central London and how to get there. There are also minicab services. Minicabs look like regular cars, not black cabs, though they still have licenses on display. Minicabs are only allowed to take you if you have booked them in advance. Even if you talk to a minicab driver waiting outside a club, you should still call their office to book them. Transport for London have a helpful webpage here with details of booking taxis and cabs, as well as the Cabwise mobile app which will find you a taxi or cab wherever you can. Barclays Cycle Hire: Known locally as Boris Bikes (after London mayor Boris Johnson) Barclays Cycle Hire bicycles can be hired for low prices all over central London. Prices for the bike hire services can be found on TfL's website. The payment system is a bit complicated but is explained well. Essentially, within a 24-hour period you can take a bike out for up to thirty minutes at a time, as many times as you like, for £2. If you keep the bike for more than thirty minutes you will incur extra charges. These charges go up exponentially so ensure you deposit the bike at a rack as soon as you are finished with it to save unexpected surprises. Direct Enquiries Accessible travel, hotels and attractions, etc. This page was last edited on 5 August 2014, at 22:26.